Central Park is Bolingbrook's most heavily used and frequently visited park. 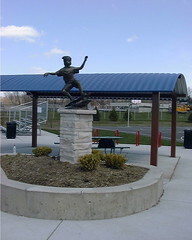 The 72-acre park is home to the Annerino Community Center, the Park District Administrative Offices, the Park District's Buildings and Grounds Facility, BJ Ward Elementary School, Trojan Field, Bolingbrook T-Ball Association, Bolingbrook Flag Football, Bolingbrook Girls Softball Association, and the Central Park Skate Plaza. 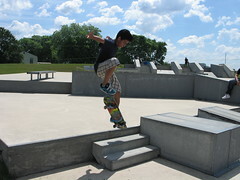 Central Park Skate Plaza is Bolingbrook's second skate park and one of the premier skate parks in the Midwest. 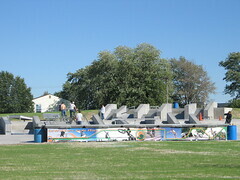 Bolingbrook's first skate park opened in May 2004 at Indian Boundary Park. As you can see, the Central Park Skate Plaza is substantially larger and completely made from concrete. The project was one of 40 included in the 2004 bond referendum. Central Park Skate Plaza can be found one mile east of Route 53 between Briarcliff Road and I-55/Frontage Road (visible from I-55). It is 14,400 square feet (that's about a third of an acre). 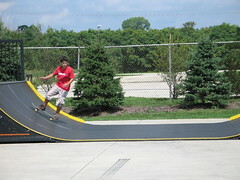 The equipment manufacturer is Solo Ramps of Quebec, Canada. There are: 7 Ramps, 1 Jump Ramp, 26 Ledges, 5 Banks, 8 Rails, 17 Stair Cases, 23 Steps, 9 Slide/Skate Benches, 1 Platform, 2 Skate Boxes. The streetscape design was planned to mimic an urban plaza. Bikes, skateboards, and rollerblades are welcome. 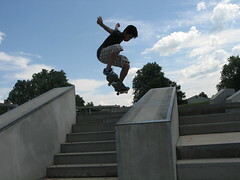 As at Indian Boundary, there is no charge to skate in a Bolingbrook Park District skate park. The Skate Plaza is built into the existing grades of a ten-foot high berm that allows spectacular views of Central Park. Even if you are not a skater, the site offers a wonderful place to wander, reflect and relax! 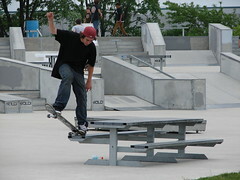 Completed in November 2003, the Indian Boundary Skate Park is part of a 76-acre sports park. Basketball, tennis, five baseball fields, concession stand and a bike path are also at the park. 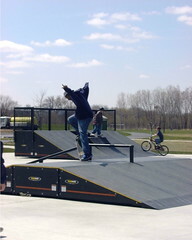 The Skate Park can be reached by bicycle along the DuPage River Greenway trail or by car. Turn north on Indian Boundary Road off of W. Boughton Road. This innovative park has ramps placed on a 110' x 100' concrete pad. The east edge of the pad is a concrete curb wall with a steel edge for grinding. The wall varies in height.